Over 60 magical items designed specifically for spellcasting classes, as well as a guide to make your own magic focuses. A review copy of “Enhanced Focuses” was provided by the publisher. Find more DMs Guild Reviews on my website and YouTube channel. Pure spellcasters often get shafted when it comes to loot. Although D&D Fifth Edition is far less loot-focused than previous editions, martial fighters and hybrid spell-and-sword slingers rejoice when finding armor, weapons and trinkets. For spellcasters, much of their power reside in their spells, leaving them with a more limited selection of useful magical items. “Enhanced Focuses” is nice repository of magical trinkets and items designed specifically for spellcasters. Instead of granting new abilities, these class-specific magical items enhance existing spells and powers, making it a useful loot table for your spellcasting players. The new magical items are divided into four categories: Arcane, Druidic, Holy, and Bardic Instruments. Although they are categorized as focuses given their spell-enhancing nature, they’re functionally class-specific magical items that all require attunement. These items would make fantastic rewards for personal quests, or as a nice treat for those player characters with a strong theme, such as a poisoning druid (Venom Fang), a necromancer wizard (Undeath Tome, Terror Blade) or an illusion-weaving bard (Gnomish Grindbox, Ghastly Draailier). Since all of these nifty magical items are tied to specific classes, they can contain interesting new modifications to spells or additional effects to class abilities such as Wild Shape, Channel Divinity, and Bardic Inspiration. For example, a simple but useful Elemental Staff can be tied to any element to match the player’s theme, granting them an additional damage die when casting the appropriate spell type. The Rally Drum grants temporary hit points when bestowing Bardic Inspiration equal to the Inspiration die + the spellcasting modifier. The Scouring Rod adds an additional Blinding effect to anyone who fails the saving throw against the cleric or paladin’s Channel Divinity. The Shadow Totem spews out magical Darkness when a druid Wild Shapes while also granting them the ability to see through it, and advantage on Stealth checks. With over 60 focuses there’s something for everyone here, though I was a bit disappointed to find hardly any Uncommon or Tier 1 items. 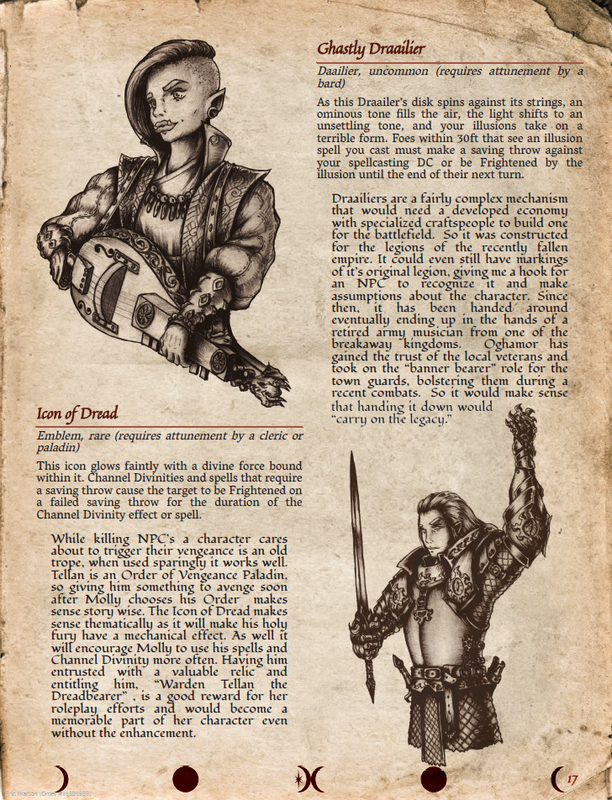 Three of the class types have only one or two Uncommon items, while nearly half the Bard’s instruments are Uncommon. Granted most of these items would fit better later in a PC’s career as a rewarding and satisfying bolster to what their characters do best, but it would have been nice to get a bit more variety in the power level. The second half of the supplement provides a section on creating your own focuses. It’s less about the mechanical aspects and more from a role-playing and character-building point of view, which I very much appreciate. The designer uses the example of four characters and four sample focuses which are clearly drawn from their own campaign, giving it a richly personal touch. We get to see the design process for how and why these items were created, as well the scenarios in which the PCs acquired them. It’s fun to read and gain insight into the design process, and each one provides an excellent example on how to design a personal magic item specifically for your player characters. 15-20 new thematically appropriate magical items per spellcasting class, for a total of 65 new focuses. The second half is a guide to creating your own focuses, as well as an excellent tutorial for how four of the focuses were created. A detailed list of hooks and tips for granting PCs their enhanced focuses. The focuses are a bit top-heavy when it comes to power and rarity, with most landing in Tier 2-3. 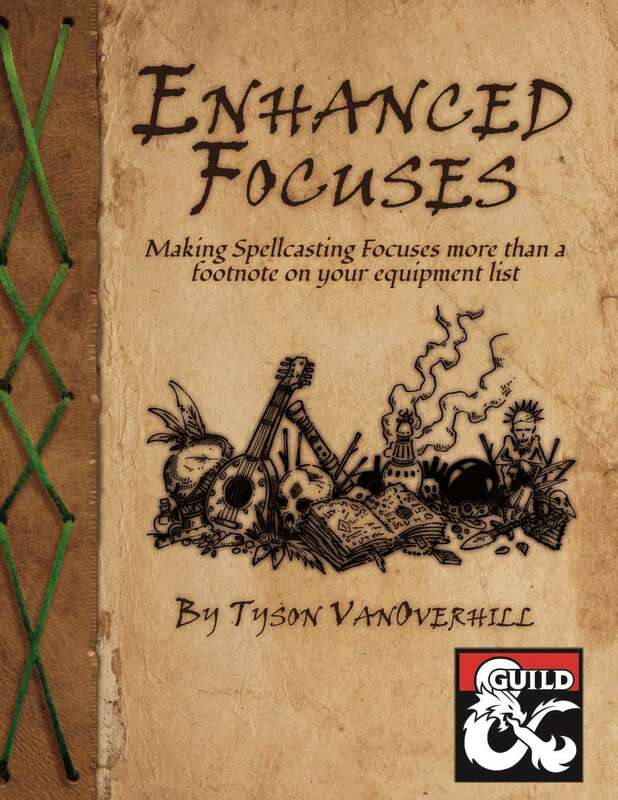 The Verdict: “Enhanced Focuses” provides dozens of solid spell and ability-boosting magical items for spellcasters, as well as a nice create-your-own section with a rich personal touch.